4.5 million Americans are bitten by dogs each year according to the Centers for Disease Control. About 20% (1 in 5) usually leads to the necessity of medical attention. Our Pittsburgh law firm helps western Pennsylvania residents recover when injured by animals. Unfortunately, a large number of animals who injure people are not first time offenders. When animals attack, and the owners are aware of any history of violence, they have a duty to warn and protect the public from their animals. Each county in Pennsylvania has different requirements about licensing and handing of dogs and other animals. Allegheny County requires a permit for each dog in the county. Owners of animals have a legal and moral duty to make sure that their animals are properly cared for, and restrained so as not to injure people. Accidents can happen, but dogs can be weapons and can cause irreparable harm to people, especially small children. Most people have at least heard of stories of small children with permanent scars on their face due to dog bites. Most of these are preventable. Animal attacks and dog bites can occur even though the animals had not shown any vicious tendencies. If you or a loved one has suffered a dog bite injury or animal attack, you should notify the authorities at once. A police report should always be filed in animal attacks, not only to document what happened, but also to help prevent the animal from harming anyone else. 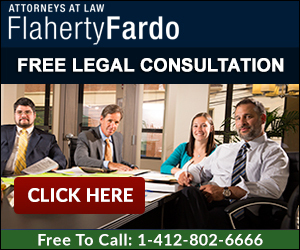 If you have any questions about a dog bite injury or animal attack, Flaherty Fardo offers free consultations. Consults can be done on-line or by calling our offices at 412.802.6666. Our representation for all personal injury cases is based on a contingent fee structure. There is absolutely no fee unless we obtain monetary recovery. We advance 100% the costs and are only reimbursed from the client’s share if we are successful.